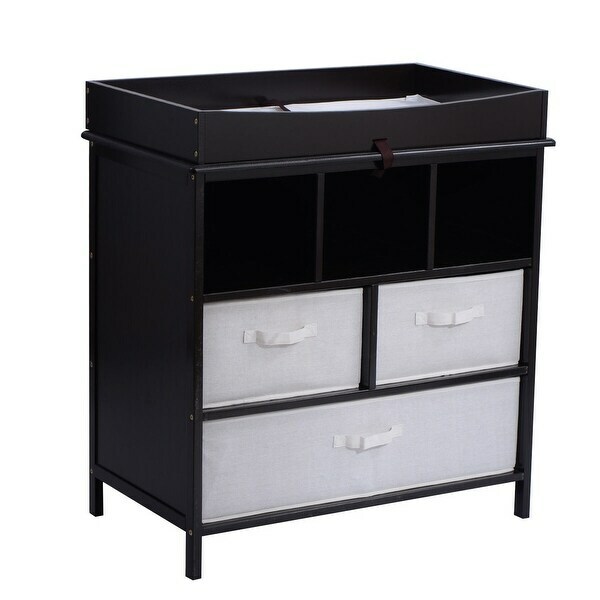 This Baby Changing Table keeps everything tidy and concealed for a clean look in the nursery. Large hamper for dirty duds, or for storing bulk packs of diapers, blankets, and toys. The hamper easily removes from its shelf to carry to your laundry room. Or, use the hamper elsewhere in the nursery or your house, leaving you a convenient spot in the changing table for your diaper pail or storage. Three pull-out baskets are ideal for changing supplies, clothes, socks, shoes, and toiletries. The baskets are also fully removable for use separate from the table, leaving you convenient, open storage cubbies/shelves.